I made this Toy Story Birthday Cake Design as my first cake ever! I’m not going to say it was the easiest thing to do but I’m sure its not the hardest either! For the cake I just used a box cake and baked it in a loaf pan, to give the bed shape. I crumb coated it with the Wilton buttercream recipe. I then covered it with a white layer of marshmallow fondant that I made. For the pillow I made it out of two Graham crackers covered in the marshmallow fondant. After that I then covered it with the blue marshmallow fondant that I made. The blue did not come out to the color I wanted but it was good enough for me. I trimmed the excess off the blanket. Then I used a Star fondant cutter to cut out the yellow stars on the blanket. For the headboard, I made it out of gingerbread cookie dough that I cut into shape then baked. 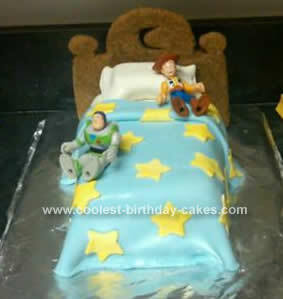 After all done I topped it with a Woody and Buzz toy. They are Imaginext figures sold at Toys R us, Walmart or even Target.